I decided to create many new gadgets (using the proxy gadget approach) to extend the features of MaxGUI. Here you can grab latest version (bin win32 and source code). 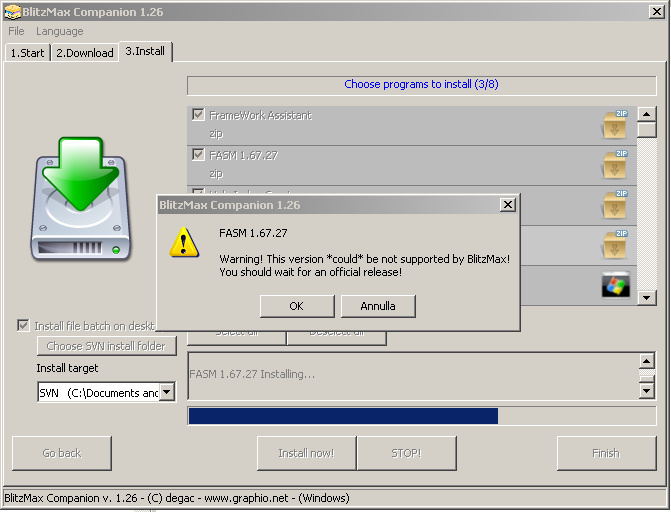 This program manages the downloading and the installation of files (mainly related to BlitzMax language or its IDE) to simplify users’ life. 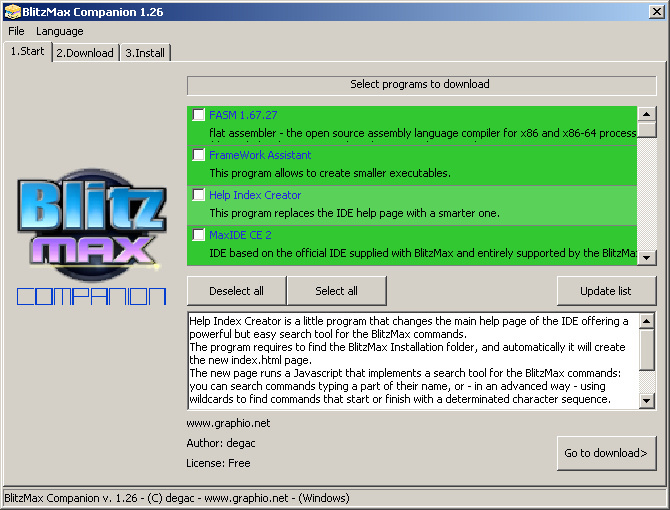 BlitzMax Companion is a program similar in philosophy to Synaptic on Linux system, just targeted for BlitzMax use. It requires – of course – an internet connection. Supports 2 languages (english – as default, and italian). The program reads a list reporting the information about the program (name, url, web site of developer, licence) and a ‘bigger’ file description. At the moment I’m working on rev. 2 – not release date is defined – that uses the new Localization module, a better application codification and corrects many bugs. 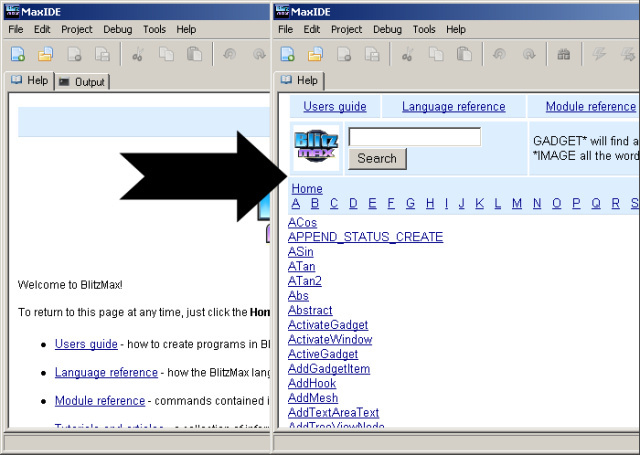 This program rebuild the index.html page of the IDE Help system introducing a search function for the BlitzMax commands. Commands you can looking for are all the commands reconingzed by the DocMods function (You can just add them simply using the correct syntax – see docmods for more information). The program replaces the index.html page that is built as standard by the IDE with the function REBUILD DOCUMENTATION. So you need to rerun the program every time you choose to rebuild the documentation. The search function is powerfull and easy. You can type just a part of the command (as gadget) and you the system will show all the commands that contains the word gadget. You can also search with wildcards: gadget* shows only the commands that start with gadget, *gadget will show only the commands finishing with the gadget word. This version comes with a GUI. 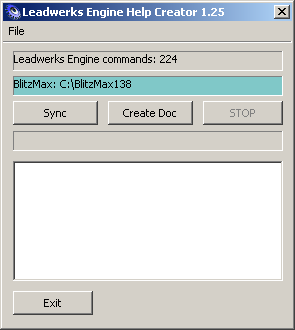 It allows to change the path where BlitzMax is installed and it saves the information (in plain text) in a config.txt file. It allows to choose to rebuild or not documentation directly by this application – the infomration is saved in the config.txt file (as 1 or 0). The program can run directly from CLI, just type something like HELPINDEXCREATOR.EXE RUN (or any other word) and the program hide the gui. In any case the program uses the informations saved in the config.txt file. Started to translate in italian the BlitzMax core-help (the documentation related to the language itself, the IDE, the BMK etc). Next step – under work – is to create a translation of all the commands for the BRL & PUB modules. This zip contains the SRC folder – just copy into the already present (note: you need the original SRC folder because this zip doesnt’ contain some files). Il prossimo passo – al momento in corso d’opera – è quello di iniziare a tradurre tutti i comandi presenti nei moduli PUB e BRL. Questo zip contiene la cartella SRC, basta copiarla su quella già presente nella cartella di BlitzMax. Attenzione: è necessario che la cartella originale sia già presente, perchè questo zip non contiene tutti i file necessari. 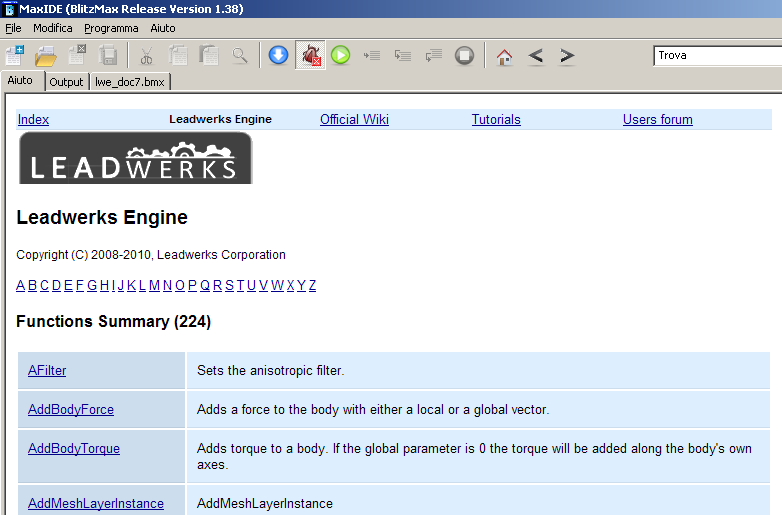 This program creates local documentation for the LeadWerks Engine, usable for MaxIDE. It is based on the Wiki definitions, so the content can be updated quite easy via the program.